The first electric waffle maker dates back to 1911, and the first known cast iron waffle maker was patented in America in the late 1800s. But as simple as they seem to be, waffle makers have so many different variations these days that it can be a daunting task to look for the one you want. The trick is to know what options are available — this makes it a lot easier to narrow your search. Waffle irons usually come in either Belgian or American sizing. Round Belgian waffles are lighter, fluffier, and crispier than square American waffles, which are smaller and have shorter “wells” in the middle. In cooking terms, a significant difference between the two foods is that Belgian waffles are leavened with yeast, whereas American waffles are raised with baking powder. Most waffle makers on the market today are electric, automatic, and non-stick. Users plug in the machine, pour in the batter, and wait until a light comes on to signal that the waffles are ready to eat. The appliance will most likely have an internal thermometer programmed to signal when the waffles have reached an optimal cooked temperature. 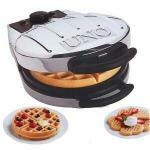 Most feature a non-stick coating that allows the waffles to lift easily from the base, and aids in clean-up as well. 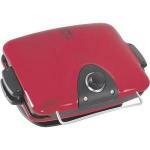 Brands such as Cuisinart, VillaWare, Chef’s Choice, and Presto are all popular choices for electric waffle irons. When browsing through all the different styles of waffle irons out there, you’ll also come across models that have a “flip” option. Companies added this professional feature to home appliances in hopes that flipping the appliance upside-down would distribute heat more evenly. However, the accuracy of these claims is still up for debate since several product testers aren’t able to tell a difference. In any case, flipping a waffle iron does add a certain amount of fun and flair to the cooking experience, so it’s a great feature to have when making breakfast with your kids. While most waffle irons are electric and non-stick, there are other models that stay true to the traditional cast iron method of making waffles. Chefs that use cast iron waffle makers say that the waffles’ crisp, fully cooked texture is superior to the ones that automatic appliances produce. But it doesn’t come easy. The process is similar to using a cast iron skillet. Cast iron waffle makers must be pre-seasoned before use and should also be cleaned by hand. They may not ideal for home cooks that need a no-fuss automatic appliance, but for waffle aficionados that crave quality over convenience, cast iron is a good option. People concerned with the potential harmful health effects of cooking on non-stick surfaces may opt for cast iron as well. Here’s one by Rome Industries to consider. This is an okay waffle maker. Not bad. Not extraordinary. Just okay. If you are a true waffle fan, stop waffling around: Get yourself a real waffle maker.